The MYCarriage project is aimed at reducing the burden of infectious disease in Malaysia. A project led by researchers from the University of Southampton aimed at reducing the burden of infectious disease in Malaysia has been shortlisted for the prestigious 2017 Newton Prize. Thanks to international collaboration between Southampton and its partners in Malaysia, the MYCarriage project has been shortlisted for the Prize. The project is now eligible to win up to £200,000 from an annual £1 million fund, in recognition of the best research or innovation that supports the economic development and social welfare of developing countries. With financial support from a previous Newton Fund institutional Links Grant, Southampton’s Dr Stuart Clarke, Associate Professor of Infectious Disease Epidemiology and his colleagues in Malaysia, developed an infectious diseases research network called MYCarriage. The previous Newton Fund award of over £120,000 has helped the researchers to examine more closely the prevalence of bacteria that cause pneumonia, sepsis and meningitis with a view to the introduction of appropriate vaccines and better antibiotic prescribing whilst building local capacity in public health. 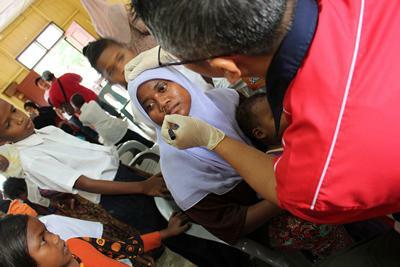 “Infectious diseases, climate, and migration are important drivers of change in Malaysia and our collaborative partnership has helped to establish a surveillance network that is ready to undertake further studies to provide data for informing which vaccines may be added to the national immunisation schedule,” said Dr Clarke, the project’s Chief Investigator and Co-ordinator. “Our project has, for the first time, provided estimates of carriage for the major bacterial respiratory pathogens in Malaysia which is important prior to larger population-based surveillance both pre and post vaccine implementation, and to provide an estimate of the prevalence of antibiotic resistance in the country. “Our partnership has also enabled staff and students from the UK and Malaysia to gain knowledge, skills and abilities from this collaboration,” Dr Clarke added. The network includes Universiti Sains Malaysia, the International Medical University, the National Public Health Laboratory, Universiti Malaysia Sarawak, Universiti Sultan Zainal Abidin, Universiti Tunku Abdul Rahman and University of Southampton Malaysia. The Southampton team comprises investigators from Medicine (Academic Unit of Clinical and Experimental Sciences and Academic Unit of Primary Care and Population Sciences) within the University of Southampton. Delivered through 15 UK delivery partners, the Newton Fund is part of the UK’s official development assistance programme, encouraging Britain to use its strength in research and innovation to promote economic development and social welfare of partner countries. The 2017 Newton Prize winner for Malaysia will be announced on Tuesday, 28 November in Kuala Lumpur.